Jess Lourey, a 1988 PHS grad, published her first mystery novel this March; May Day is the first book in her Murder by Month Mystery Series. Ever have one of those months? That's the basic premise of the debut mystery novel by Jess Lourey, a 1988 PHS graduate. 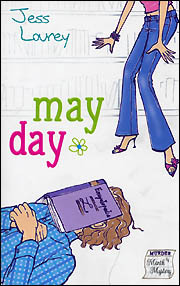 In her first book, May Day, released on Wednesday, March 1, her heroine Mira leaves a dead-end job and a cheating boyfriend in the Twin Cities and moves to Battle Lake, Minn. She quickly finds a new love interest, but then he turns up dead in an aisle of the Battle Lake Public Library, turning Mira into a sleuth. In solving the mystery, while working both as a part-time reporter for the local weekly newspaper and at the library, Mira discovers a sacred Indian site, grudges dating back to the town's 1982 state football team, and senior citizens who gather to play strip bingo. All this and plenty more in 220 pages. It's a murder mystery with Minnesota flair, epitomized by a line from May Day's press release: "revenge is a tater-tot hotdish best served cold." "May Day is fresh, the characters quirky," said Minnesota mystery author Ellen Hart, according to a press release from Midnight Ink Books, Lourey's publisher. "Minnesota has many fine crime writers, and Jess Lourey has just entered their ranks!" May Day is part of Lourey's Murder by Month Mystery Series. She has already finished the second book, June Bug, which is due to be released next year, in March 2007. And she is finishing her third book, Knee High by July, which is scheduled for September 2007. Her fourth book is tentatively titled August Moon. The protagonist of "May Day," like its author Jess Lourey, was born and raised in Paynesville and graduated from Paynesville Area High School. The book is set completely in Minnesota, mostly in Battle Lake. Lourey, who teaches English and sociology at Alexandria Technical College, has always been an avid reader. After writing her English master's thesis, a story about three women on a road trip, she tried unsuccessfully to get it published for two years. When she finally gave up, she picked up a mystery novel at her aunt's house and then couldn't stop reading mystery novels. "Once I started reading mysteries, I was hooked," she said. "I started reading all kinds of mystery writers. The more I read them, the more I wanted to write them." Mira, like Lourey, was raised in Paynesville and graduates from Paynesville High School before moving to the Twin Cities to attend the University of Minnesota. There are a number of additional similarities between Mira and Lourey - such as working at the Dairy Queen or having to participate in the foster grandparent program at the local nursing home while in eighth grade - but Lourey said Mira is purely fiction. "She's not at all me," said Lourey. "It's easier to write what you know," she admitted. "(But) the actual situations are totally different than mine." Mira's fictional father, unlike Lourey's, is known as Manslaughter Mark, which is a shadow that Mira has tried to avoid ever since the accident on Highway 23. Paynesville readers will find a number of familiar places and things in the book. And they will find a number of references to the 1980s, from music to wearing Guess jeans in high school. Lourey also used to live in Battle Lake for a couple years after graduating from high school. She choose it for the setting of her mystery novels because something "quirky" always happens there, she said. Like her references to Paynesville in the book, there are real landmarks of Battle Lake included in the book - such as the 20-foot fiberglass statue of Chief Wenonga - but she has also fictionalized the town. It actually doesn't even have a library. She has yet to hear if the residents of Battle Lake are flattered or offended that she has based her books in that town. Lourey dedicated her book to her parents, Diane and Ray Lourey of Hawick. She did this for "a bazillion reasons," she said. "They've obviously instilled a love of reading and writing (in me), but they've always been supportive of me in all kinds of ways," said Lourey, who identifies them as friends, not her parents, in the book. That's because they always will be her parents, she explained, but they have earned her friendship. For the past four and a half years, her mother has come once a week and babysits her kids for a night while Lourey writes. In addition to these six hours each Tuesday night, Lourey tries to write a couple times each week for a couple hours after her kids go to bed. Like exercise, writing takes discipline, she said. "But when you sit down and do it and get done, it's the best feeling," she explained. Lourey starts with the basic plot - who did it and why - in mind and then writes from beginning to end. "It kind of writes itself," she said. She always writes 10 new pages and then goes back and edits 20 pages (her 10 new pages and the 10 previous ones, too). When she is done, she has a friend edit it, which is mostly encouraging. Then she pays - $5 per page - to have a professional editor read it and offer improvements. She now can write a mystery in six months. She also is working on a gothic novel and a memoir for women whose husbands have committed suicide. Getting published takes perseverance, said Lourey, who was rejected by 300 agents before finding one who agreed to represent her and got May Day published. "You've got to have thick skin," said Lourey, who sent 20 query letters per day and had 200 letters out before first rejections came back. By then, she had the momentum to keep going and get May Day published. It helped that she really believed in May Day. She can still read passages from her book and they make herself laugh. "If I can make myself laugh, there's something there," she said. "It's something that I wanted to read." She also kept writing and had June Bug well on its way when she signed with Midnight Ink a year ago, in March 2005. Having two books done made her more marketable as a series writer, she said, which is what publishers want for mystery novels. Normally, it takes about 18 months for a publisher to turn a finished manuscript into a published book, said Lourey, but May Day got published faster since Midnight Ink is a new company. She finished June Bug in August 2005 and it will not be published until March 2007. Lourey hopes May Day, which had a first printing of 5,000 copy, could sell enough to warrant a second printing. The book retails for $13.95 - her cut is 50� per book - and is available at Barnes and Noble, Borders, www.amazon.com, and other bookstores. More information about May Day is also available at Lourey's website www.jesslourey.com and at the website of her publisher www.midnightinkbooks.com. A challenge for Lourey now is publicizing May Day. Writing, she said, is a solitary endeavor; doing publicity for a new book - newspaper interviews, television spots, etc. - is just the the opposite. "Success for me would be to be able to make my living off my writing," she said. Then she could write full time and teach as a hobby, instead of teaching full time and writing as a hobby. Unlike Mira, who is still trying to finish her master's degree in English, Lourey has earned hers, as well as a second in social responsibility.. She has taught at Alexandria Technical College for seven years. She lives in rural Alexandria with her two children, Zoe and Xander.